[I got it in my head to have another #instagrampreservation party over the weekend when I found out the first of the Kirby cucumbers were coming to the market. I’ve learned a few things, so this time around was (a little) less hectic than the strawberry jamming session.] Pickles are my happy food. Perhaps, like my cousin-in-law Jonah, my people come from the pickling capitol of Poland, or maybe it’s the childhood memory of Brauer’s stainless steel bowls of salty, crispy treats (complementary, of course). The first thing I would do? Poke around looking for the sour green tomato lurking somewhere in among the briny cukes. The bowl was filled with a range of half and full sours, some crisp and still tasting of cucumber and others fermented into a cucumber of a different sort altogether. This is the the deli spear, cloaked in damp wax paper, packed with the hot pastrami on rye. I love these pickles. They are fun to make, easy enough to get your kids involved, and in three days you can be biting into cold crunchy pickles (or frying them). We’re embracing the abracadabra of lacto-fermentation. 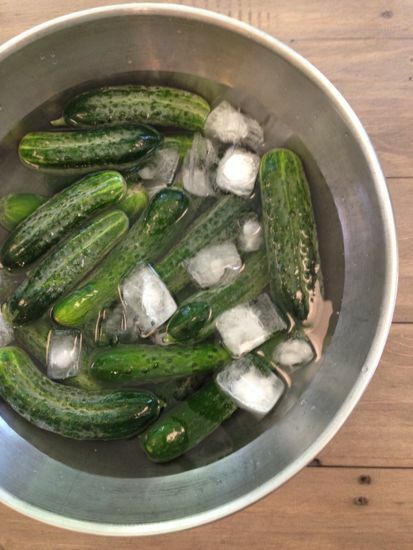 SOAK THE PICKLES IN ICE WATER FOR 30 MINUTES. You’ll need 3 pounds (or more – you can scale this recipe up and make as many or as few as you would like) IMG_0339 AFTER THE SOAK, REMOVE THE BLOSSOM END. DON’T KNOW WHICH IS THE BLOSSOM END? TAKE A LITTLE BIT OFF EACH END AND CALL IT A DAY. Kirby (pickling) cucumbers, Kosher or pickling salt and non-chlorinated water. Possible (entirely optional) flavorings include garlic scapes, garlic cloves (peeled, not crushed), crushed dried red pepper, jalapeno/serrano/Thai chile, dill (fresh or seed), coriander seed, celery seed, caraway. All these flavors work, but not all at once. Pick and choose, or make different blends up for each jar. 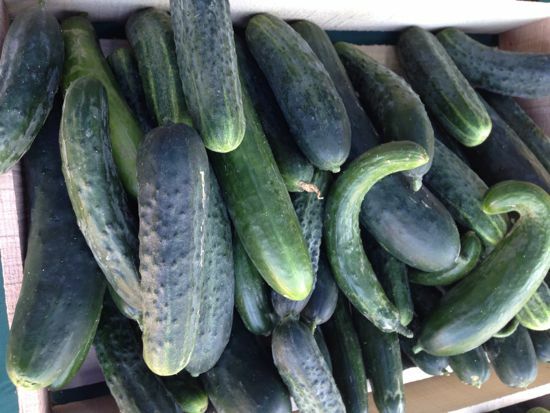 Shop farmers markets and farmstands for Kirby cucumbers, sometimes called pickling cucumbers. Salad cucumbers do not make satisfying pickles. Neither do Persian cucumbers. Smaller is better, straight, not curved, shapes fit into jars more easily. Hew toward variety in presentation. Quarter lengthwise for spears, cut thick chunks, slice thin chips. If you’ve got one, use a crinkle cutter. Keep a few medium sized cukes whole. If you missed the party, I’ve got you covered. 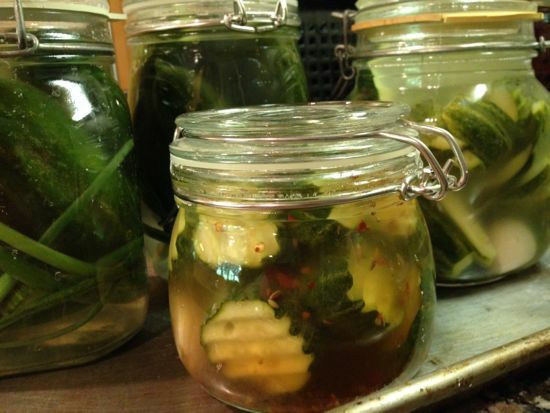 Here is a step by step pickling tutorial. MAKE THE BRINE. COOL COMPLETELY. 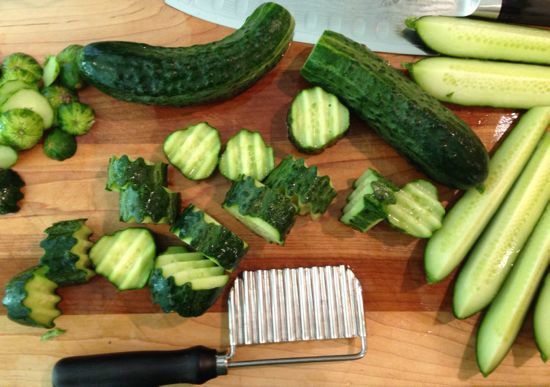 FLAVOR YOUR PICKLES! ADD TO EACH JAR SOME OR ALL OF THE FOLLOWING: GARLIC SCAPES, FRESH DILL, WHOLE GARLIC CLOVES, DILL SEED, CORIANDER, JALAPENO, RED PEPPER FLAKES. OR NOTHING AT ALL. YOUR CHOICE. GRAB YOUR CRINKLE CUTTER. WHAT? YOU DON’T HAVE A CRINKLE CUTTER? PACK THE JARS MAKE MORE BRINE. IT NEVER FAILS…. YOU WON’T HAVE ENOUGH. 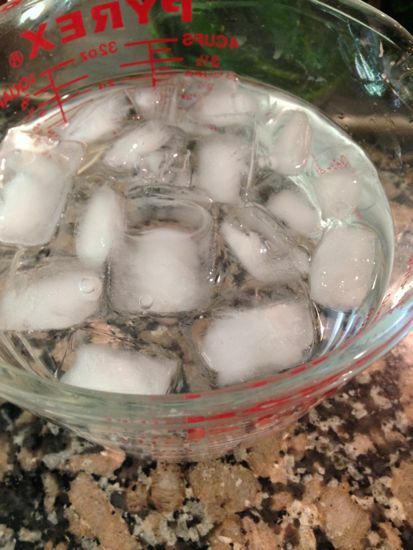 USE HALF BOILING WATER AND HALF ICE FOR A QUICK COOL DOWN. WAIT THREE DAYS. THE PICKLES WILL BUBBLE AND GET CLOUDY. THAT’S OKAY. TASTE AFTER THREE DAYS. 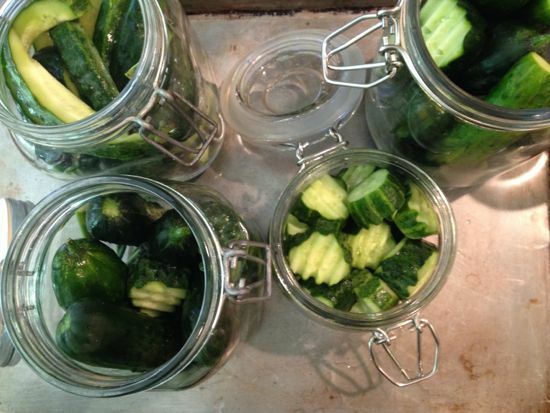 GIVE ‘EM ANOTHER DAY IF YOU WANT A MORE SOUR PICKLE, OTHERWISE REFRIGERATE ‘EM AND EAT WITHIN A MONTH. After three days, you can make a little snack of frickles. Yes, fried pickles = frickles. I did not make this up. Fried Pickles (Frickles) A snack for four or two 8 pickle chips or 4 spears 1/2 cup panko crumbs 1/2 cup all purpose flour 1/2 teaspoon salt 1/2 cup cold water Safflower or grapeseed oil Maldon or coarse sea salt (sparingly) Line two baking sheets with paper towels. Drain the pickle chips or spears on one sheet, in a single layer. (Batter won’t stick to wet pickles.) Whisk together the flour and salt, then whisk in the water until the batter is smooth. In a wide cast iron or other heavy skillet with straight sides, heat about 1/2 inch of oil until smoking (325°F). Dip the pickles into the batter, then dredge in panko crumbs. Drop that frickle into the hot oil. Fry the pickles for two to three minutes then turn and fry the other side for another two to three minutes. Remove from the oil and drain on the paper towels. Sprinkle with salt. Batter and fry the remaining pickles allowing the oil to return to temperature between batches. You had me at frickles! FRIED PICKLES YOU SAY? 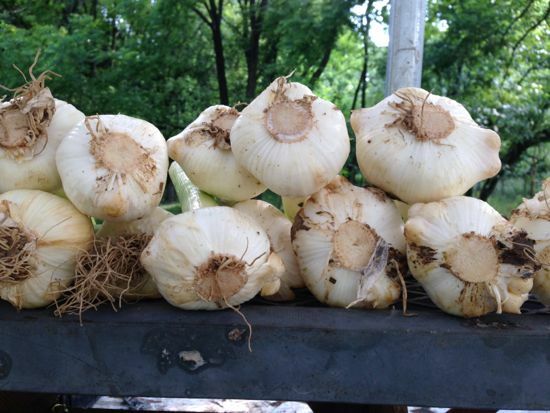 That’s called burying the lede, my pickling friend:) Love this, Cathy! I am assuming thatcher cooled brine is then added to the packed jars, right? The jars then stay on the counter for 3-4 days , right? Then put the jars in the refrig ( with the brine in the jar) and eat within a month. The refrig must then stop the fermentation process. Well done, i threw 3-4 pounds of whole kibys into a large pickle jar with dill and garlic cloves. The last 25%, I cut into spears. added the brine and waited a day, tasted one spear, not ready, after the second day, the brine was starting to get cloudy and the sample spear was starting to taste good. On the third day, The brine was cloudy and after I opened the jar, a rush of bubbles came to the surface. This must be the fermantation process I thought. The tasting spear was awesome. The jar went to the fridge and tonight we feasted on spears and whole sours! Doubtful the will last a month. So glad you liked them! Now — fry ’em! 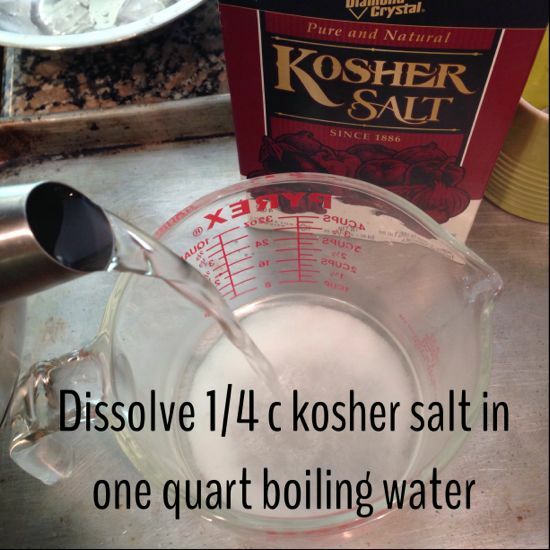 I tried this recently, but the brine bubbled up and spilled over. Did I do something wrong? I added garlic, dill seed, peppercorns and a bay leaf. And, I used filtered water from the faucet, so I’m not sure the chlorine is filtered out? 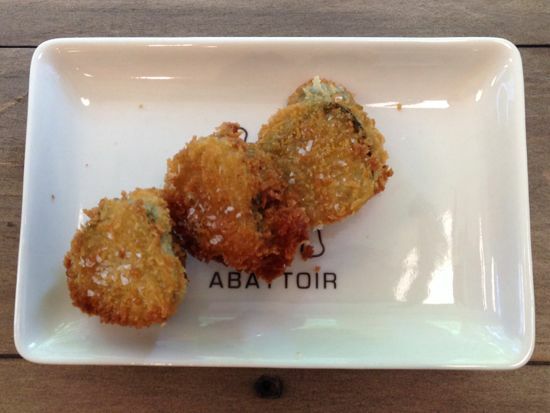 I had fried pickles at Macon Bistro & Larder the other weekend and I thought they were amazing. Would love to give making them a try! It all looks so good. I had fried pickles one time. I didnt know they were called frickles. Very funny. I love them. I have to maek them again some day. And you are so right- seems like you always have to make more brine. These are refrigerator pickles, so no, they can’t be on the shelf like that… but a vinegar based dill pickle is made to be shelf stable. 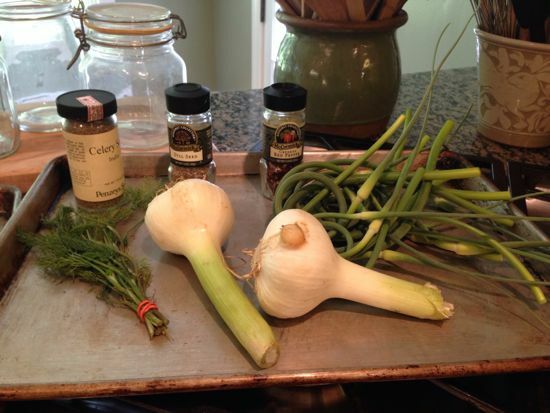 I’ve got a recipe in my book for a great garlic dill pickle. Sorry!! It’s not available until November, but you can preorder! My husband loves these so much I can’t make them fast enough! So good and so easy to make! Thanks for introducing me to the joys of fermentation! I have the carrot and kohlrabi slaw underway today.